Last night, I dragged my parents over to Café Mozart Bakery, a Korean bakery in Plano right next to 99 Ranch Market (an Asian market). 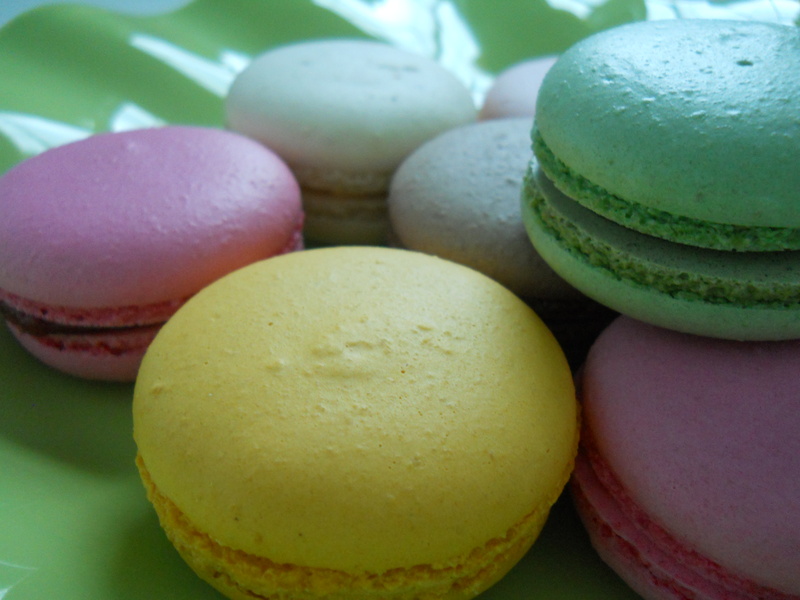 We went in, and I bought an iced mango green tea and one of each of the eight French macaron flavors they have. 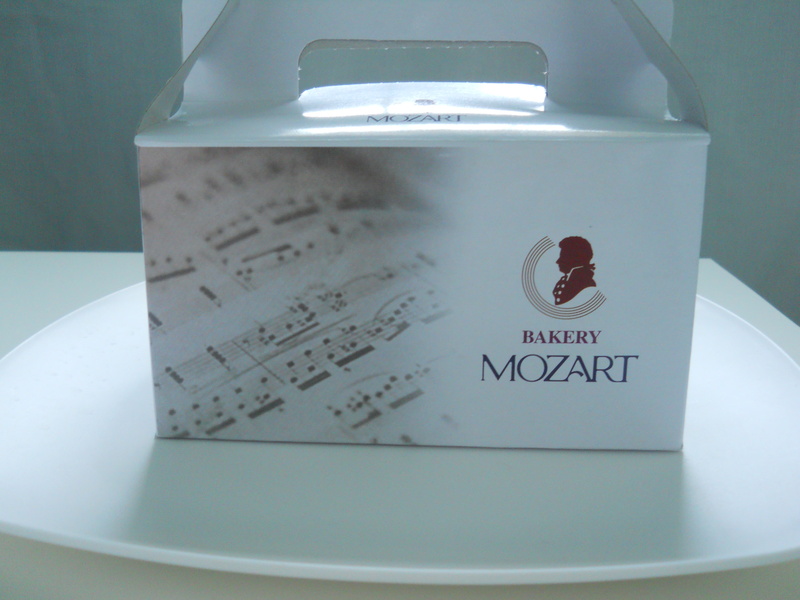 One of the things I love about Café Mozart is that they actually have macarons! Maybe it’s because I don’t go into bakeries very often, but I haven’t found the French macarons I grew to love anywhere in the Dallas area (actually, I should say “Plano” area, because I’m not making the hour-long trip to downtown). Inside this box was my favorite French confectionary: macarons! I’m not sure what exactly happened, but somehow nine macarons made it into the box. (Raspberry was repeated.) I can’t complain though, I do like macarons after all. 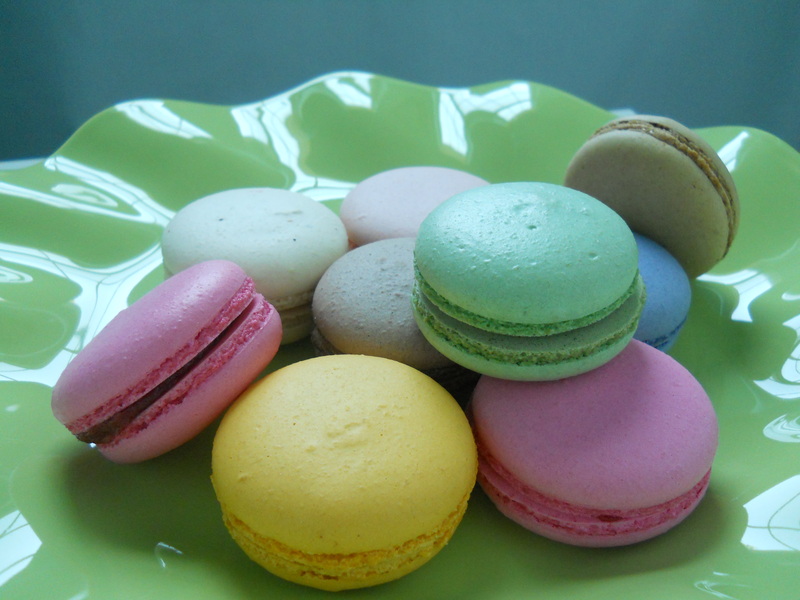 The eight flavors of macarons that Café Mozart carries are Blueberry, Chocolate, Coffee, Green Tea, Mango, Raspberry, Strawberry, and Vanilla. My personal favorite is mango, but my little brother likes vanilla. Richard likes the raspberry flavored one the best! I also used this time to try a little food photography! Unfortunately, I only have a small digital camera (Nikon Coolpix L22) so my pictures aren’t nearly as good as other food bloggers. I really admire food bloggers and food photographers because they get the food to look so good! I’ll have to get a nicer camera in the future, just for the purpose of taking pictures! 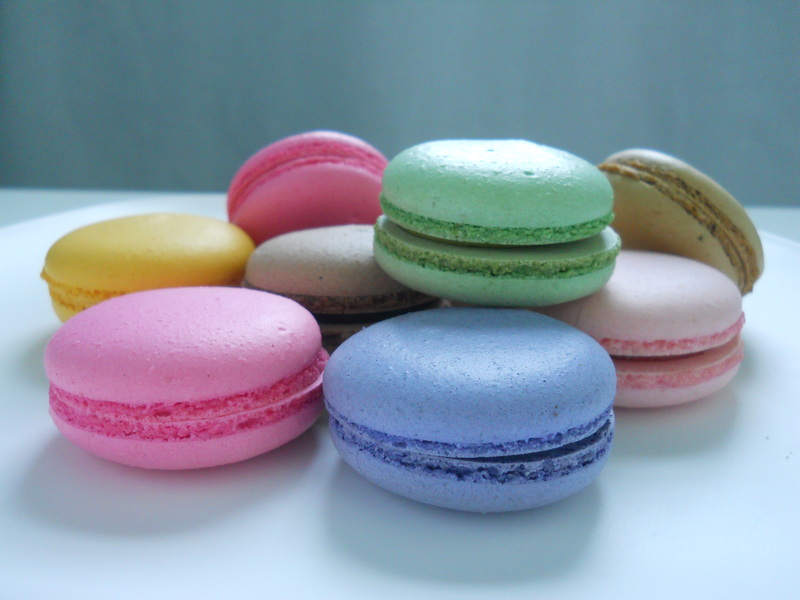 A macaron is a sweet, almond-based, French confection. They’re all different colors and flavors and very visually appetizing (as well as actually appetizing)! 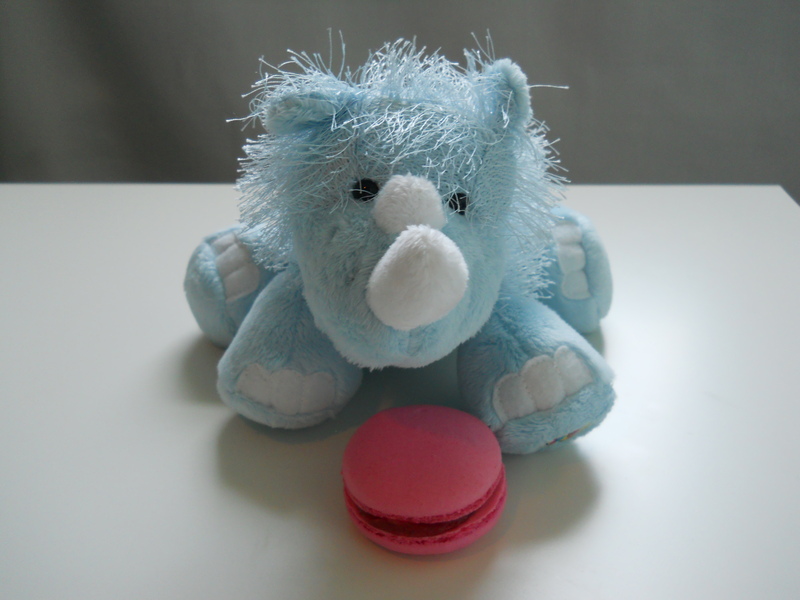 My first taste of the macaron was in Paris, France in 2009, about a month after I turned 11. My mom, a major foodie, brought us to Ladurée, a luxury cakes and pastries place well known around the world for their macarons. That probably spoiled me, but there’s nothing wrong with having good taste, right? I forgot about my favorite French confections until about a year later, where I saw them again in the basement floors of department stores in Tokyo. My mom’s friend from when she and my dad used to live there brought my mom and I to the department store and even bought us some macarons! Auntie Kaori, you’re the best! 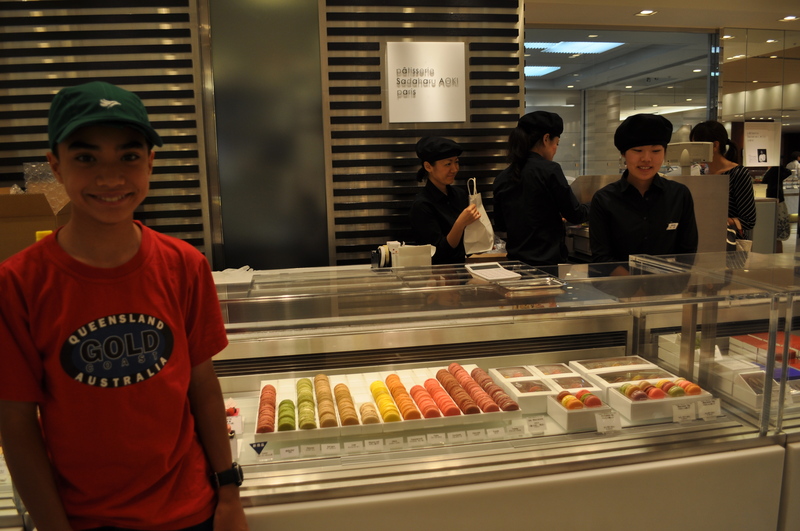 Me in front of Sadaharu AOKI’s second boutique in Tokyo, housed in ISETAN department store. Notice the many flavors of macarons available (and the green Cebu Pacific hat!). Not only that, but we even tried putting them on different colored plates other than the commonplace white used in most food photographs! After it was over, I got to have the pleasure of eating some of them. I gave the vanilla to my brother, and I split the mango one with my lola (grandma). Oh, and I gave the coffee flavor to my dad. My mom didn’t want any (she got her wisdom teeth taken out a week ago), so I was left with the task of eating the rest. Sorry for the lack of posts in the past two days everyone! There was a thunder storm – Texas weather is unpredictable — so I had no internet for a few days. And then, I got pretty busy because of DECATS. Later tonight, I will be at my friend Alessia’s house, and we will do our best to get caught up on our NaNoWriMo word count. We’re supposed to be at 15,003 words before the end of the day. I’m only at 8,435. Whoops. Anyway, I’m working on some new posts about DECATS (my Culinary Arts and Journalism classes included) and another thing that I’m not sharing just yet! Plus, I signed up for a GoodReads account. I’m trying to read more, because as we all know, reading improves our writing! Mmm, those look SO good!